I love Ruth, she was also a strong woman. Think what it must have taken for her to follow Naomi back. Her sister-in-law took the easy way, back to the shelter of her family. She took the hard road. I think she must have loved God so much that she didn't want to give him up. She certainly had the grace of God on her for her steadfastness in following Naomi. The book of Ruth is a perfect example of God's impartiality. 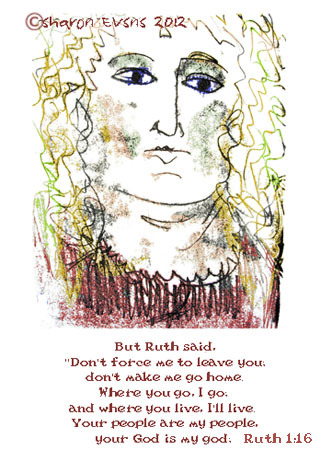 Although Ruth belonged to a race often despised by Israel, she was blessed because of her faithfulness. She became a great-grandmother of King David and a direct ancestor of Jesus. I often wonder if she had a sense of the role she had to play in mothering an ancestor of Christ. The lesson that Ruth gives us, is that our love for God if steadfast and true will bring great blessings. This picture is a mono print where I inked a sheet of glass and laid a sheet of paper on it and then draw. Lifting the paper off you get the image on the other side with interesting textures. It is one of my favourite mediums for drawing, as what you get is always a surprise. Very nice and so great to meet you! The story of Ruth is a beautiful love story and the story of God's love for us as well. Nice to meet you through SS. What a great post, and story - love the technique you shared with us too!